SERVICED EVERY YEAR, OIL CHANGES, ETC. Access to the accommodations is via a sliding door in the aft bulkhead of the cabin. 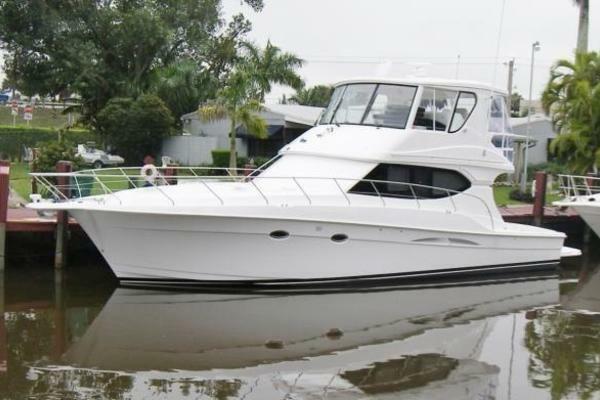 Located forward is an anchor locker and directly aft is the forward cabin with a double berth, cabinetry and 2 lockers. Adjacent is a water closet with an electric flush head, custom countertop with sink and enclosed shower, which has a molded seat and bi-fold door. Directly aft is a centerline passageway with steps up to the main salon and galley. The main salon to port contains an L-Shaped leather cushioned settee with storage below, a cherry table and access to the generator. To starboard is the galley with cherry cabinets, an electric 2-burner cooking surface, built-in microwave and coffee maker, a full-sized refrigerator and freezer and custom countertop sink. Aft and raised above the machinery space is the main salon, which has a vinyl headliner, cherry joiner work and cherry cabinetry, carpeted sole with custom window dressings, and a leather sofa and ottoman. Also located in the main salon adjacent to the main companionway is the custom Silverton circuit breaker/electrical panel. Further aft is the 2nd stateroom cabin with a double-berth, cabinetry and a locker. Adjacent is a water closet with an electric flush head, custom countertop with sink and enclosed shower, which has a molded seat and a bi-fold door. The windows are covered with Venetian-style blinds. The flybridge is located atop the main cabin superstructure, is accessed via molded steps extending from the well deck upward. The flybridge is fitted with a custom stainless bimini frame with canvas bimini and full enclosure of canvas and eisenglass. Additionally, located forward is a Plexiglass spray shield fitted across the forward end and along the port side. Located aft is a custom hardtop supported by aluminum pipe supports at the outboard sides of the flybridge and the aft corners of the well deck. Atop the hardtop is the aluminum radar pedestal complete with radar array and GPS antenna. The flybridge and superstructure is additionally fitted with appropriate navigational lights, speaker and dual trumpet electric horn. 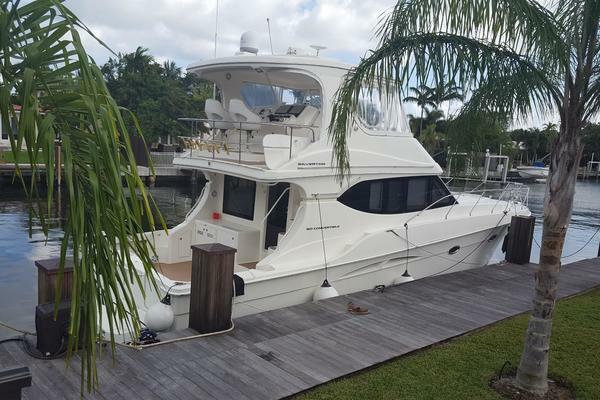 The flybridge is fitted with custom vinyl cushioned pilot sea and co-pilot seat, 2 vinyl cushioned settees with internal storage area, an operator’s console and custom electronics console. The vessel is wired with neoprene clad marine grade wiring. Electrical system is 12v/110v AC and DC with 120v/30amp and 240v/50amp shore power fittings. Switchboard is of the custom design Silverton dead front type and overload protection is obtain by means of circuit breakers and fuses. Two 12v batteries are aboard to provide a 12v starting system for the main propulsion engines. 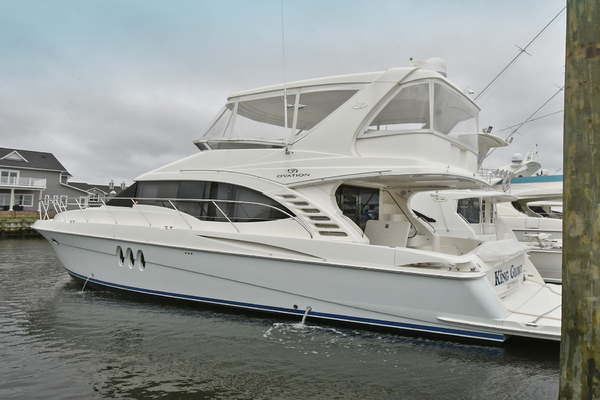 Our Silverton listing is a great opportunity to purchase a very nice 35' 351 Aft Cabin. 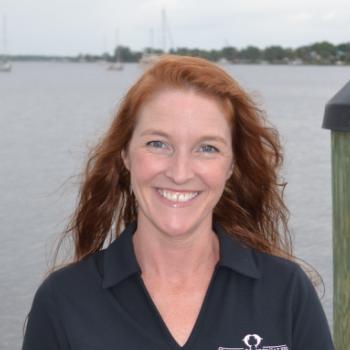 She is currently listed with United Yacht Sales broker Tania Andre' who can answer all questions about the boat for you. Please don't hesitate to reach out to our team of professional yacht brokers to schedule a showing. There are many yachts listed for sale on the MLS each with a different history. We look forward to helping you complete your search for the perfect boat or yacht for sale.